Whimsy and Parchment... : Alice Munro wins Nobel Prize for Literature! 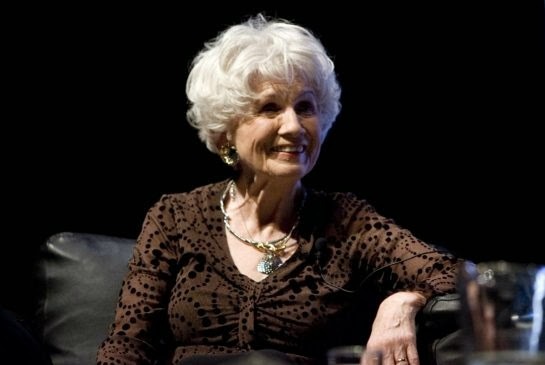 Alice Munro, Canadian Author, has won the 2013 Nobel Prize for Literature!! If you don't know who Alice Munro is, I'll forgive you - she's a bit of a quiet, unassuming literary legend, but still a legend all the same. She's been called a master of the short story, and she's been writing longer than I've been alive - her first book was published in 1968. This has a bit of a personal side for me, I'll be honest! First of all, I'm Canadian and I take personal pride when one of our own does well. Second of all, I happened to grow up two blocks away from the woman and I know first hand that she's a wonderful, quirky personality. She loves lemon meringue pie and she dearly loved her husband, Gerry, who passed away April of this year... It makes me sad that he didn't get to see this honour bestowed on her. Her books mainly draw on her roots - rural southern Ontario, where she grew up and where she has lived most of her life. She writes strong, complex women and explores the realities of growing up female, and also touches on her own family. If you haven't checked out her books before, then I definitely suggest that you do now!